changes. They brought in a new guitarist, Simen Hestneas (Borknagar) for extra vocals (he even does lead on a song) and about a page of extra musicians. I knew at this point that I would be in for a ride. So with my ticket in hand, I borded the train entitled "La Masquerade Infernale". 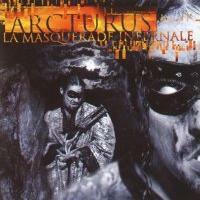 Arcturus's music. Hellhammer is perfect as usual, and the guitars stand out a lot more with nice technical riffing that seems to cut through the songs. Sverd is still strong on keyboards and is one of the reasons this album is such a strong one, but you can't forget the other guest musicians on this page playing violins and trumpets among other insturments. Simen Hesatnaes has incredible vocal ability, which shines on this album, doing backup on "Master of Disguise", "Painting My Horror" and even singing an incredible lead on "The Chaos Path". Easily my favorite song on the album. It also sounds almost carnival like with the keyboards playing around with different passages and Hestnaes fluctuating his voice in amazing ways. Not to mention, the end of the song shows a techno beat to mix things up a little. The rest of the album shows many different changes style, with Sverd playing some swing like keyboard parts and one of my favorite intros to a song on "Of Nails And Sinners" with a stylish keyboard chime, rimshot intro. This is one of the most elaborate and incredible albums I have ever heard. Arcturus has followed up their debut with a masterpeice that ranks at the top. If you don't have this album, you should be dead.